The current behavior that we guarantee is that any configuration we receive that does not explicitly set a value for dist is given a default value of precise. 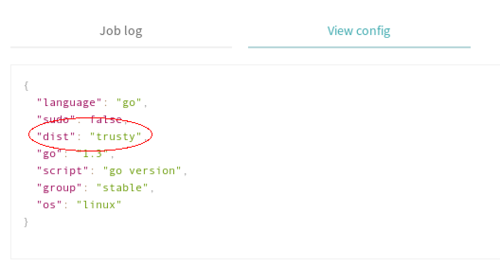 Once the rollout process is complete, the new default for all incoming configurations will be dist: trusty. As mentioned in the introduction, our tentative plan is to make dist: trusty the default for all configurations to by the end of August 2017. Once this rollout is complete, our attention will turn to the retirement of container-based Ubuntu Precise. The tentative plan is to begin overwriting configurations that specify dist: precise to include sudo: required beginning in September 2017. By the end of September 2017, we hope to have 100% of incoming configurations with dist: precise routed to the sudo-enabled infrastructure, and to retire the container-based infrastructure. We have no immediate plans to discontinue support for jobs that specify sudo: required and dist: precise, although we do not plan to update the images for these jobs any more.